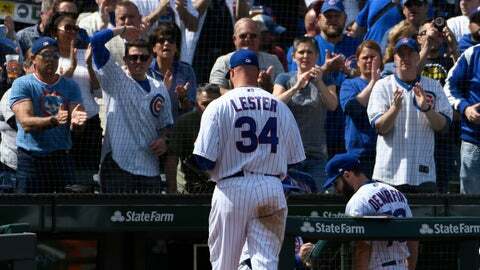 CHICAGO (AP) — Left-hander Jon Lester was put on the 10-day injured list by the Chicago Cubs because of a strained left hamstring. Injured while scoring from second base on Ben Zobrist’s single in Monday’s home opener, the Cubs’ ace will miss at least one turn. The five-time All- Star is 1-0 with a 2.57 ERA in three starts after going 18-6 with a 3.32 ERA last year. Right-hander Tyler Chatwood will start in Lester’s place on Sunday against the Los Angeles Angels.